A new messaging app has hit Google Play, cooked up by the minds over at Google. 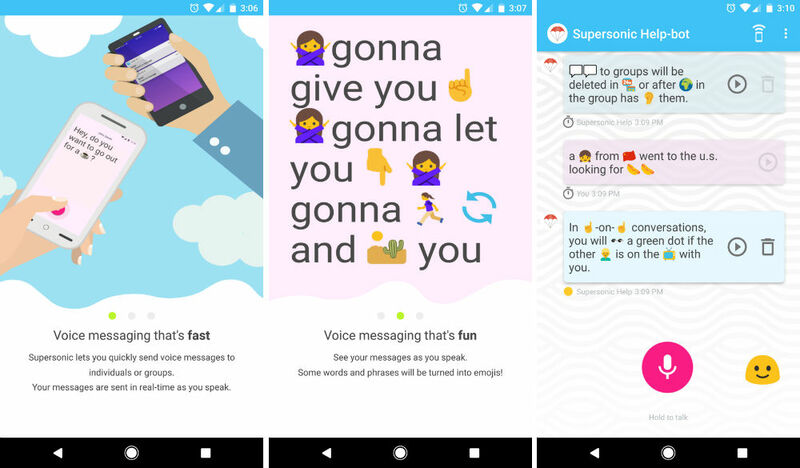 The app is called Supersonic, an emoji-powered voice app that converts your speech into shareable emoji messages. Think of it as a walkie talkie app, but instead of realtime communication, the app listens to your message, uses its brain to change words into emoji characters, then shares the message with a single recipient or group of people. Now, before you lose your mind, this is not a Google-published application, but instead, is an Area 120 creation. Area 120 is a startup incubator for Googlers who want to work on new projects. What this means is, no, Supersonic isn’t going to replace Hangouts or Android Messages or any nonsense like that. It’s just a fun, unique way of communicating with your friends. As for using the app, it’s actually pretty sweet. Once you download it, you will log into your Google account, attempt to get a few friends to use it with you, then start chatting away. To start a message, hold down on the mic button, speak your message, then the app will do its work in converting speech into emoji. Keep in mind, not every word is supported by an emoji, but the built-in bot states that over 5,000 words are supported. After your message is changed, it will be sent off to your friend. On their end, the emojis will be spoken aloud (a feature that can be disabled), which helps decipher all of the different emoji characters. You can always attempt to translate the emoji yourself, which could be fun. I chatted with the bot for a bit and it does seem to work quite well. If you have a friend that might enjoy using Supersonic with you, give it a try!